In times of need, Linda Spencer 79MPH PhD RN was there. She crisscrossed the globe to provide nursing care and training, working tirelessly to improve lives. Spencer, a retired clinical associate professor and U.S. Army Nursing Corps colonel, died of esophageal cancer on November 12, 2016, in Marietta, Georgia. During a career spanning more than 40 years, Spencer held assignments with the International Committee of the Red Cross (ICRC), the World Health Organization, the Centers for Disease Control and Prevention, the American Leprosy Mission, and the U.S. State Department. She once met Mother Teresa while working on a leprosy project in India. As an American Red Cross first responder, she was deployed to the scene of the Oklahoma City bombing, assembled volunteers to support the response to Hurricane Katrina, and assisted Haitian earthquake evacuees at Dobbins Air Force Base in Marietta. Beginning in 2001, much of Spencer's work focused on the role of the public health nurse in emergency preparedness. At Emory, she coordinated the former Public Health Nursing Leadership MSN program and helped develop a disaster-preparedness simulation exercise as part of an undergraduate course in community health nursing. She also secured funding from Emory's Rollins School of Public Health to develop a coalition of Georgia nursing schools to introduce emergency preparedness into the curriculum. Spencer's work did not go unnoticed. In 2002, she received the Florence Nightingale Medal from the ICRC in Geneva, Switzerland. With Spencer's award came a touching letter from Emory alumnus Max Cleland, former Georgia U.S. senator and Vietnam War hero. In his letter, Cleland 68G 79H congratulated Spencer, noting that public health and disaster nurses like her do more than give care. They also are "givers of hope," he wrote. 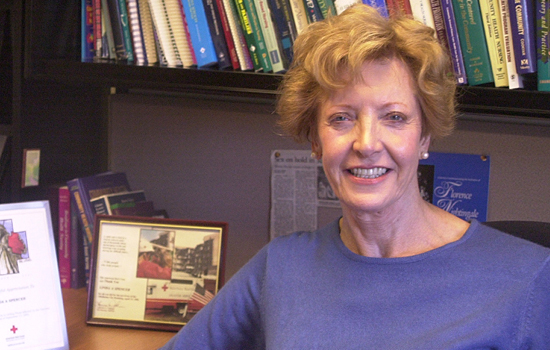 Memorial gifts honoring Linda Spencer may be made to the Emeritus Faculty Scholarship Fund. To give online, visit emry.link/emeritus-faculty. Or make checks payable to Emory University @ NHWSN; 1520 Clifton Road, Suite 446; Atlanta, GA 30322; Re: Emeritus Faculty Scholarship Fund.